Large amounts of public and private money is spent on culture in our member cities, and others like them. Yet despite the importance of this spending, knowledge about its scale, scope and impact has remained limited. Our World Cities Culture Finance Report, published on 03 May, is the first global comparative study to examine how much is spent on culture in world cities, by whom, and where the money goes. It is designed to help policymakers be aware of the full ‘toolkit’ of options for supporting culture, giving them the knowledge they need to understand and navigate an increasingly complex funding landscape. Over 60% of all public direct culture funding is provided by city and local government. 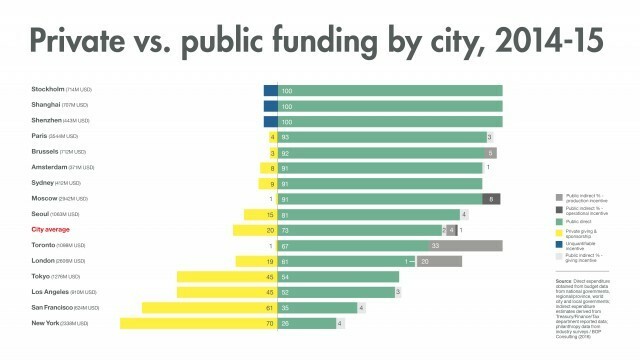 In United States cities, culture funding is dominated by private giving. Outside of the US, with the exception of Tokyo, no other city has more than 19% from private sources. Chinese cities are increasingly investing in newer and more commercial cultural forms, and in the creative industries in particular. Individuals dominate private giving to culture in the US and UK. Corporations dominate private giving in Asia. Indirect public funding, including tax breaks and fiscal incentives, is growing in importance. Cities need to get better at capturing this and measuring its impact. As well as an introductory comparative analysis, the report includes detailed profiles of the cultural funding landscape in sixteen member cities: Amsterdam, Brussels, Istanbul, London, Los Angeles, Moscow, New York City, Paris, San Francisco, Seoul, Shanghai, Shenzhen, Stockholm, Sydney, Tokyo, and Toronto. Data on cultural funding is not easy to gather. This report took eighteen months to produce, requiring in-depth collaboration between the BOP research team and the member cities listed above. By developing a shared framework and common approach, we have produced the most detailed comparative picture in existence and provided a foundation for future data-gathering and research, both by individual cities and on a comparative basis.